In 1988 Klarich teamed up with surf photographer Rick Doyle. They met on one of the first photo shoots for Skurfer the previous summer. Mike Murphy (Tony’s uncle) was the first big dealer for Skurfer, and since Tony was hanging around and could do a few tricks on the skiboard (that’s what the thick foam filled ones were called before the thin wakeboards), he was invited to the photo shoot. Doyle owned a handheld waterproof housing that he used to shoot surfers, and he adapted it to mount on a Skurfer. The pics of Tony Finn (front man for Skurfer) riding with the board-cam were a first in towed watersports. After the successful shoot with Doyle, Klarich decided to hire him and all his groundbreaking equipment for a shoot. The camera and housing weighed well over 10 pounds, and it was challenging slalom ride for Klarich. Doyle used a remote control from the boat to take pictures – 36 images for each roll of film. After a few short minutes of skiing, it took about 10 minutes to put in a new roll. In the days of real film, it was another week before they were able to see the slides. The images were groundbreaking in water skiing, and were run in magazines around the world. 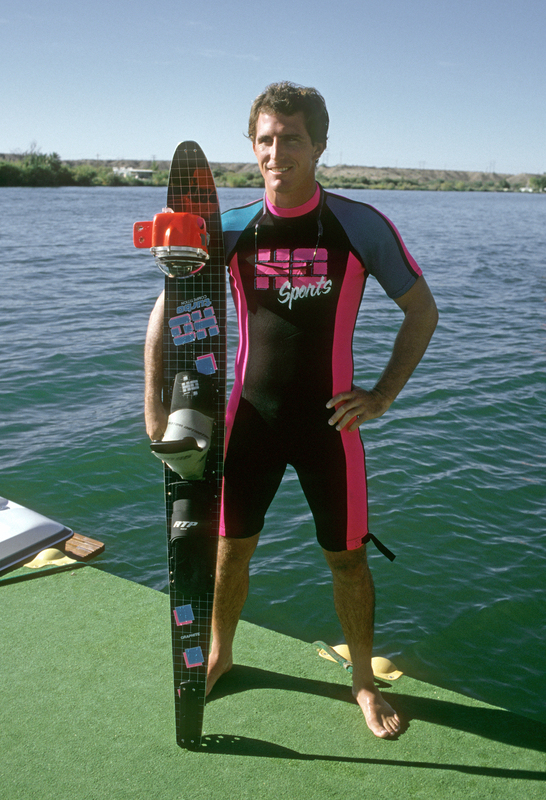 A few years later Doyle used this same rig to take shots of Scott Byerly riding his wakeboard on lake Powell. One of those shots was named best wakeboarding photo of the 20th century by Wakeboarding Magazine.